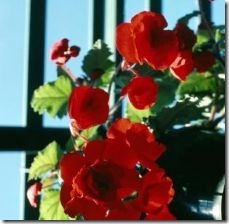 Begonias include several different types of plants, including wax begonias, angel wing begonias, Rex begonias and tuberous-rooted begonias. 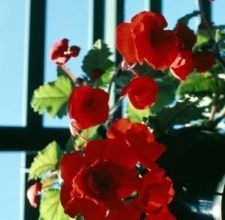 Begonias perform best in partial sun, moist, well-drained, nutrient-rich soil and moderate temperatures with high humidity. They sometimes succumb to diseases or insect pests. Gray mold and powdery mildew sometimes affect begonias, encouraged to grow by the moist, humid environments favored by these plants. Both diseases occur very commonly on a variety of plants, causing fuzzy gray or powdery white growth on the leaves. Large populations of mealybugs may develop on begonias, especially wax and angel wing varieties. These waxy bugs feed on leaves and roots, producing a sticky substance known as honeydew. Spots on the begonia that appear cotton-like occur as many bugs congregate in an area or when eggs are laid on the plant. Control fungal diseases with fungicides. Planting areas with proper spacing and good air circulation decrease the risk of developing fungal diseases. Small mealybug populations may not need control. In severe cases, dispose of the plant, as mealybugs prove very difficult to eradicate.